The canonica at San Cristoforo is home to Richard Dixon and Peter Greene, former Londoners who have lived and worked here full-time as translators, web site builders and copywriters since 1988. We are always on hand to give you advice and help to make the most of your stay. As writers of Italian guide books and travel web sites (see our Marche Voyager website at www.le-marche.com), we can also give you plenty of useful information on what to see and do while you’re here. We are also quite happy, though, to be invisible, if that’s what you prefer. You can find out more about Richard’s work as a translator at www.write.it . A walk through the alpine flowers in the upland meadows in late spring, a swim in high summer in the rock pools of Cagli’s two rivers, and a visit to the late autumn truffle fair in the nearby town of Acqualagna are among the attractions that give this area its particular fascination. 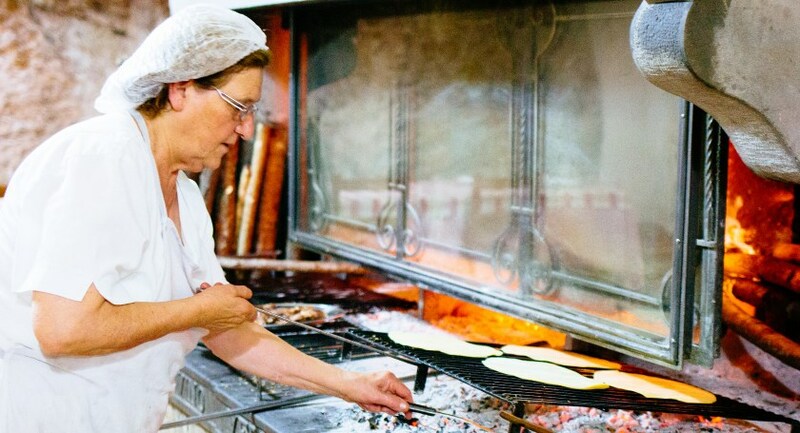 Cagli itself, a beguiling small medieval town, is only 5 km away. The Marche (sometimes known as the Marches in English) form the Adriatic seaboard of central Italy. 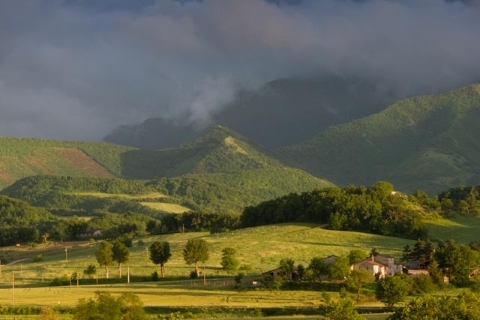 Despite splendid countryside, noble towns and welcoming people, the region has yet to be discovered by the tourists who crowd out neighbouring Tuscany and Umbria. By air: The nearest airports for scheduled flights are Ancona (just over an hour’s drive), Perugia (around 2 hours) and Bologna (2hr 30mins); Ryanair offer cheap scheduled flights from London Stansted to Ancona and Perugia, and from other UK airports to Bologna; from summer 2018 Easyjet are flying from London Gatwick to Ancona twice a week. BA, Alitalia and Easyjet offer flights to Bologna from London and other UK airports. Cars can easily be hired from all three airports; charges are usually lower if you book a fly-drive package when you buy your ticket. Rome Fiumicino airport is a three and a half hour drive away, a good choice for intercontinental flights. By rail: Pesaro and Fano (45 minutes by car) are on the main north -south Milan to Bari line. The taxi fare from Fano is approximately 100 Euro; there is also a sporadic bus service. Fossato di Vico, 30 minutes away by car, is on the main Rome-Ancona line. We should underline, however, that you will need a car while you are here. By car: See our Google map to see where we are; when you book we'll send you clear directions to drive here. The weather from May to September is generally warm and dry, and the occasional bouts of bad weather pass relatively quickly - in June, July, August and September rain occasionally falls in intense but short thunderstorms. The coastal town of Fano, 40 minutes drive away, has two pleasant beaches, as well as a fishing port and fine historic centre. These beaches are rarely crowded and, as well as the usual serried ranks of umbrellas and deck chairs, there are stretches of free, public beach. We prefer to swim in the river on the other side of Cagli where there are plenty of spots along the water's edge to enjoy the sun. Our own Marche Voyager web site - an English-language online tourist guide to Italy’s Marche region - should give you plenty of information. You’ll find it here. You can also get a copy of our very own guidebook to the region Le Marche: an insider's guide, available either as a paperback or as an ebook download. See this page for more details and to buy a copy. 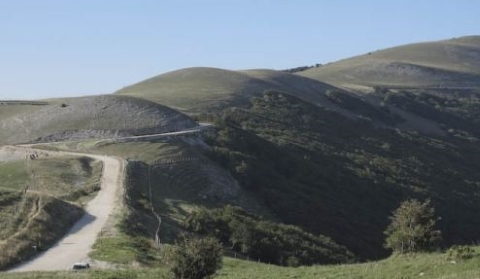 The best map of the area for motorists is the 1:200,000 Touring Club Italiano - Marche e Umbria sheet, or the Michelin 1:200,000 map #359 of Umbria-Marche. We can lend you more detailed maps for walking in the mountains on our doorstep. Many guests seem quite content to idle away their stay here, sitting on their terrace admiring the view while sipping their aperitivi. 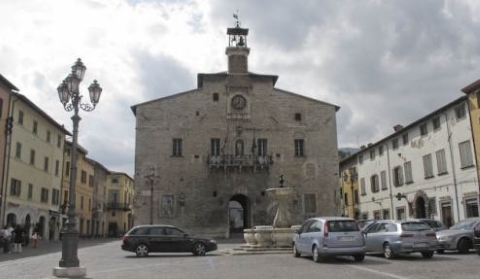 But Cagli is also an ideal base for visiting some of the more interesting sights of central Italy, many of which remain relatively unknown to the tourists who crowd out nearby Tuscany and Umbria. Urbino, 30 minutes away, is one of the unsung glories of Renaissance Italy, a small city that owes its splendour to one extraordinary man, Duke Federico da Montefeltro. At the Palazzo Ducale you will find one of the country's most beautiful palaces and an outstanding collection of pictures, including two of Piero della Francesca's most ravishing works. Gubbio, 25 minutes away, is an outstanding example of a medieval town whose narrow streets wind up to one of Umbria's finest piazze. South west, some 90 minutes away, lies the beautiful town of Assisi, home of Italy's patron saint, St Francis. The frescoes in the great basilica represent some of the finest examples of the art in Italy and the upper part has now been restored and re-opened after the 1997 earthquake. Other towns of great interest within less than two hours reach of Cagli include Perugia, Arezzo, Spoleto, Ravenna and Rimini (yes, it does have a splendid old centre and is not all sun & sand...and actually the s & s is quite fun if you approach it in the right spirit). Back in Le Marche places to visit include Jesi, Fano, Pesaro, San Leo, Loreto, Recanati and Macerata. On our doorstep there are plenty of fascinating small towns and villages whose beauties remain undiscovered by guidebooks - the castle of Frontone in the shadow of the Appennines in front of San Cristoforo, the monastery of Fonte Avellana , immortalised by Dante, the market town of Pergola, and the fortress towns of Mondavio and Corinaldo. At Frasassi, 40 minutes away, you will find a remarkable series of caves which includes the largest single cavern in Europe and some of the most extravagant stalagmites/tites you are ever likely to see. There are plenty of short strolls in the immediate vicinity of San Cristoforo. 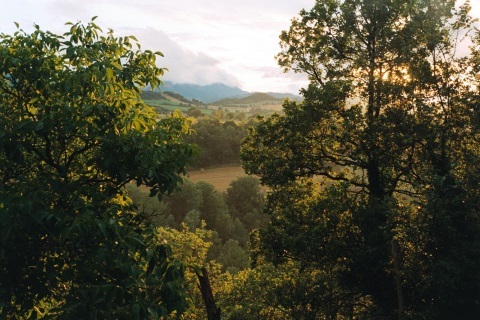 The peaks of Monte Catria and Acuto that dominate the area provide limitless possibilities for proper hiking and picnics. In May and June the mountain meadows are carpeted in wild crocus, narcissus and asphodel while in autumn the beech woods are breathtaking. If you would like even further details about either property and the area download our 20-page PDFs La Casetta - a User’s Manual or La Pieve - a User’s Manual - complete with house notes, restaurant and shopping guides, menu translator and more.